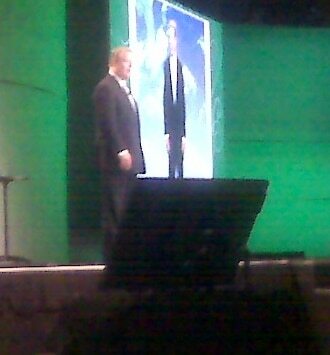 In April of 2009, I was at an industry event where one of the speakers was the former Vice President of the United States, Al Gore. He made a couple of predictions and as I look back on them it is quite obvious he was right. No, no… I am not talking about that! I am of course talking about the wireless industry. The event was the 2009 CTIA trade show in Las Vegas, and Vice President Gore was the keynote speaker on the final day. This was when CTIA was still at the Las Vegas Convention Center rather than the Sands Expo. CTIA often has a pretty big speaker on the final day and, as I assume it was intended to do, I stuck around to hear what he would say even if it is not directly related to the wireless industry. In this case, my expectations were pretty low but Mr. Gore made his comments very relevant. I often think back to what he said and how accurate he was about his predictions for the wireless industry. Although he also spoke about global warming and national security, his comments that have caused me to reflect the most over the ensuing years were those he made about the economy and politics, particularly, how the mobile handset would really impact our nation. Acknowledging that the speech was over seven years ago and I can’t find a complete video or copy of the text anywhere online, I still think it is worth sharing my recollection of these two topics. Bear Stearns, the investment bank and brokerage firm, had just collapsed in September of 2008 and at the time of his speech we were in the heart of the 2008-2009 subprime mortgage meltdown. Attendance at CTIA was pretty low and the overall morale of the those attending the show was even lower. While I never thought of Al Gore as an optimist, he spoke about how we were on the front end of a revolution and how as an industry we would continue to invest in infrastructure to meet growing demand. He was right. At that time, according to Wikimedia, Apple had sold a total of only 17.37 million iPhones from the introduction of the original iPhone in Q3 of 2007 through the end of Q1 2009 when the second generation iPhone (iPhone 3G) was the new hot product. By comparison, Apple sold 125 million iPhones in the first six months of 2016 alone. As further evidence of how the smartphone has evolved over the last seven years, I offer this photo that I took of Vice President Gore that day with my Blackberry Curve. Although small and with terrible resolution and clarity by today’s standards, it was virtually state-of-the-art at the time! Former Vice President, Al Gore speaks at CTIA in April of 2009. Photo taken with a Blackberry Curve. Our industry was relatively stable compared to most of the economy at that time. If you lost your job in 2009 and found yourself sitting at the kitchen table trying to decide which bills to pay, you always paid your phone bill before your mortgage. You couldn’t find a job without a phone and the banks were easier to negotiate with than a cellular service provider. Recurring service revenue and soon-to-boom smartphones sales weren’t the only part of our industry that rose during the economic downturn. The LTE build out began, and that kept many people in the wireless infrastructure industry employed while many friends and neighbors in other industries were struggling to make ends meet. But bigger than our ability to endure through a struggling economy, Gore noted that information would be the dominant strategic resource throughout the 21st century. We are only sixteen years into this century but he appears to be right so far about information and how we communicate. And this leads me to the second of two things he spoke about that often causes me to reflect. When Vice President Gore spoke at CTIA in 2009 he compared the wireless handset at that time to the advent of the printing press and how information could be widely distributed to everyone. But, he said, the mobile phone will take it much further. The mobile phone would give a voice to the general population. As I recall, he stated that prior to television, politicians had to create a local presence and go door-to-door to make speeches and meet voters. This allowed voters to speak with them directly and to influence decision making. But in the era of televised politics, communication became somewhat one-directional. Politicians would speak to a camera and buy advertising to influence voters who basically sat at home and listened. This lead many voters to become a bit lazy and less engaged. Gore noted that the mobile phone would change that. It would return the power to the voters because they would have great ability to choose the source of their news and would be able to comment on what they would hear. The phone would always be within reach and the internet would allow each person to offer their thoughts and opinions to the entire world. Since that time, the explosion of various forms news and blogs as well as social media have changed our political landscape. President Obama was the first candidate to use social media as a means to distribute his campaign message. And, regardless of one’s opinion of Donald Trump, there is no denying that he won the GOP primary with very little advertising and a whole lot of tweets. I would argue that the entire Trump phenomenon would not have even occurred if it weren’t for the way communication has changed over the last several years. Entire political movements have quickly ignited and spread through social media – Occupy Wall Street, the Arab Spring and Black Lives Matter are perfect examples. Regardless of who wins in November, future candidates will view and engage voters differently. Social Media flowing in both directions will be a major part of future elections. Conclusion – Gore Was Right! As noted previously, I was not able to find a complete video or copy of the text of Gore’s speech. But I did stumble across a Liveblog by a guy named Vikram who apparently was also in attendance that day. He notes that Gore stated that when “he and Bill (Clinton) took office there were only 50 websites”. That was in January of 1993. Resisting the obvious opportunity to drop a joke about who “invented the internet” I’ll just give Vice President Gore his due. I walked into that 4,000 seat auditorium that day with an expectation of hearing a lifetime politician make a politically oriented speech about the “hope and change” that had just occurred three months earlier. Instead, I heard an excellent speech on the impact our industry will have on the future. I left feeling quite inspired and motivated, especially considering the economic environment at that time. As I do each year, I’ll return to Las Vegas for the 2016 CTIA Super Mobility show at the Sands Expo September 7-9. This year’s headline making keynote speaker will be Mark Cuban; the businessman, investor, owner of the Dallas Mavericks and star of Shark Tank. We’ll see if he, too, has any bold predictions that inspire my thinking for the next seven years.